The Earhart Ballroom is perfect for larger events, but can also be divided into 2 or 3 smaller salons for more intimate gatherings or meetings. It features a ceiling mounted projector & screen, house sound system, and smart TVs for presentations. Special Features: Ceiling mounted projector & screen, smart TVs for presentations, and house sound system. Kitty Hawk is a versatile space perfect for a variety of events from private parties to corporate meetings. Special Features: Kitty Hawk features an outdoor patio accessible from both the parking lot and inside room. There is a ceiling mounted projector and screen, as well as a house sound system. Lindbergh is perfect for private dinning or business meetings. The table features built-in outlets and USB ports for easy charging. There is a smart TV for presentations. Special Features: Outlets and USB ports built into the table for charging and a wall-mounted smart TV for presentations. 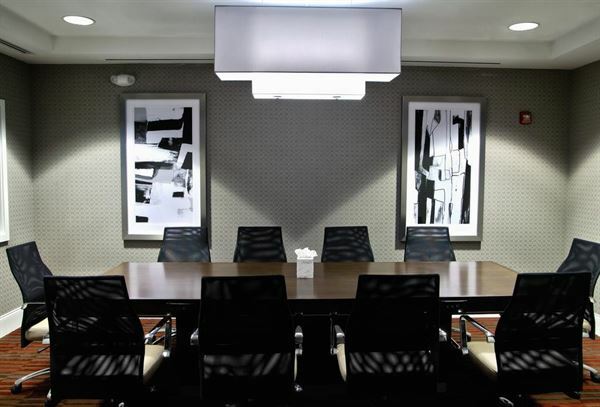 The Orr Boardroom is the perfect setting for your next meeting. The quite, secluded room features a conference table that will seat up to 10 people. Special Features: The room features a conference table that can accommodate up to 10 people with the option of adding AV equipment.